Screen Recorder Premium Software from SnowFox worth $29 as FREE Giveaway for this Merry Christmas only for 5 days. 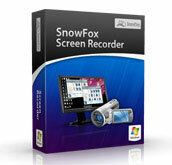 With this SnowFox Screen Recorder Premium Software, you can record any part of the screen’s activities and the cursor’s movements, using a microphone to narrate your screen recordings. Use SnowFox Screen Recorder to create video demos, record any desktop activities, capture online video, and create voice-over presentation, etc. You can download the Screen Recorder from SnowFox’s website by clicking here. Go to their FaceBook Fan Page by clicking here. Give a like and submit your email. You will get the Serial Number for using this Screen Recorder Premium Software worth $29 for FREE. Cite this article as: Abhishek Ghosh, "Screen Recorder Premium Software worth $29 as FREE Giveaway," in The Customize Windows, December 7, 2011, April 21, 2019, https://thecustomizewindows.com/2011/12/screen-recorder-premium-software-worth-29-as-free-giveaway/.